Big data is at the core of Industry 4.0, while the human factor is a couple of steps away from becoming but a mere supervisor. The blood of Industry 4.0 is big data, and the organs are Cyber-Physical Systems (CPS): systems that consist of both hardware and software, are completely automated and intertwined. Autonomous cars are an excellent example of CPS and on everyone’s minds. Autonomous cars use IoT sensors that collect data, process it, and analyze it both locally (with PLCs) and in the cloud (big data with machine learning). Based on this analysis, decisions are made, and instructions are sent to the actuators that are all over the car and apply those transmitted instructions. More directly, sensors are the eyes, actuators are the hands that do the work, and PLCs (augmented by the cloud) are the brains. This sounds good on paper. However, most industrial companies are not ready. In a Deloitte survey, only 14% of the 1600 C-suite level executives interviewed showed high confidence that their companies would be up to the challenges posed by Industry 4.0. Consumers, especially younger consumers, want products and services more accustomed to their personality and needs, even though they are becoming increasingly reluctant about giving out their data. For example, you can use big data to find out customer preferences and then machine learning in conjunction with additive manufacturing (3D printing) to customize your products, but most factories are still designed to make lots of identical items. On a newly designed autonomous vehicle, everything is top-notch, but most industries use old machinery. These machines were costly at the time, and the cost of replacing them may seem too high. You just cannot collect IoT data if the sensors break down, malfunction, or the machine breaks. Moreover, when these rugged machines eventually break, the cost of having a machine offline for just a day can also be very high. Goldcorp is a mining company, and it costs them $2 million per day in lost productivity when their hauling vehicles break down. Installed IoT sensors combined with machine learning were used to predict when the Goldcorp haulers break down, saving the company much money. When one hauler breaks, and it costs you $2 million, then it is worth investing in sensors and big data to try to prevent such malfunctions. However, maybe, when one of the machines in your factory breaks, you are not sure whether the loss in productivity is high enough for you to invest in IoT sensors or machine learning to prevent that from happening. Well, you can use big data to find out. Yes, even analyzing the opportunity to invest in large-scale big data is better if done using big data. So at first, feed the data you have on the machines, how often they malfunction, profits, costs, and based on this historical data, big data will tell you exactly how much you lose when a machine is down. Then find out how much the sensors cost and how many sensors are needed on that machine to plug it into IoT and feed it to the cloud. Big data algorithms will analyze the collected data and then let you easily visualize costs vs. benefits and also estimate the time it takes to recover the investment. Please keep in mind that moving towards Industry 4.0 is in itself an added benefit, as, in time, the data you gather with those sensors or cameras is the new gold. In time, big data and machine learning will be able to find out things that may not even cross your mind, or anyone else’s for that matter, at this particular time. Just like Six Sigma helped use statistics to improve supply chain management at the end of the 1980s being an essential part of Industry 3.0, big data is the blood that will flow through the veins of Industry 4.0 companies. It reduces costs by the improving supply chain management or doing diagnostics, it tightens process controls, reduces inefficiencies, and increases throughput. At the very beginning of the Industrial Revolution in the 18th century, Adam Smith wrote about the benefits of the division of labor and the need to employ standards. Never did he imagine this level of efficiency and automation and, from the looks of it, neither do we. Nevertheless, companies that entirely run Industry 4.0 systems will have a substantial competitive edge, just like companies in Smith’s time had an advantage by using assembly lines. Alex Bordei is Director of Product and Development at Bigstep, a company that empowers organizations determined to make sense of their data, by providing a full-stack big data ecosystem running in a high-performance bare metal cloud. 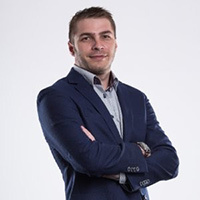 A highly technical professional with over 10 years of experience in architecting and developing high performance distributed services for the cloud market, he has an MSc in Computer Science and has always been keen on research in advanced software technologies.